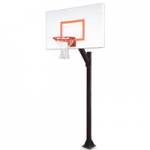 First Team Legacy in ground basketball systems are commercial grade fixed height goals designed for entry level budgets. Made in the USA to last. 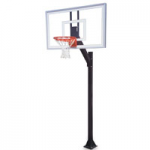 FT1100 4" Square Post FT1700 Legacy Extension Arm FT215 36" x 54" Acrylic Backboard FT186 Heavy Duty Flex Goal Lifetime Limited Warranty Approx. Shipping Weight: 205 lbs.